Craveable Brands is the latest Australian food company to ban the plastic bag from its stores. 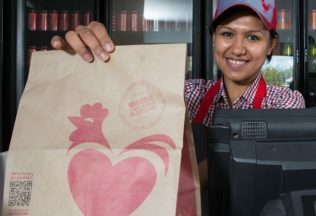 The parent company of Red Rooster, Oporto and Chicken Treat said it will no longer be restocking plastic bag supplies, instead switching to paper bags only. The decision will see some of its restaurants no longer provide customers with plastic bags from as early as March 2018. It is expected the entire Craveable Brand network will be plastic bag free by July 2018. Chief Executive Officer of Craveable Brands, Brett Houldin, said as an Australian business, it is Craveable Brands’ responsibility to reduce its impact on Australia’s environment. “With the growing concern about the environmental impact of plastic bags, removing single-use plastic bags from our 570 restaurants across the country will see 8.8 million bags removed from circulation nationally which is equivalent to 8.8 tonnes of plastic,” Houldin said. Will low-calorie sweeteners now look like meringues?